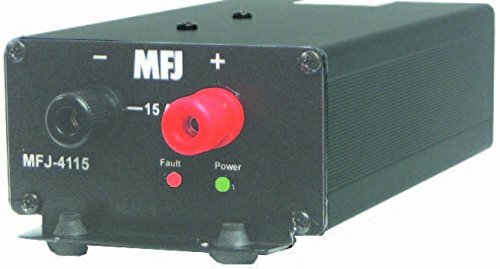 MFJ-4115 is supercompact, perfect for traveling -- weighs just 11/2 lbs and is a tiny 3 3/4W x 2 1/4H x 7 3/4 D inches. This tiny supply will easily fit in your briefcase or suitcase and power most VHF/UHF or QRP radios. Has over-voltage and over-current protection systems and works with AC input from 90 to 130 Volts. Output is 13.8 VDC, 17 Amps surge and 15 Amps continuous. It has one set of 5-way binding post connections. It is super clean, has a quiet fan and super regulation. Has load fault indicator and automatic shut-down. If you have any questions about this product by MFJ, contact us by completing and submitting the form below. If you are looking for a specif part number, please include it with your message.